Our Founding Fathers were brilliant men who were able to construct, through their agreements and arguments, a Constitution that can, and does, remain relevant and workable throughout the decades. Their earlier writings, such as the Declaration of Independence, acknowledged, among other things, our unalienable rights. For most of history, this was something new and unheard of as, prior to this, only kings and, sometimes, lords and the like had any rights. The big difference is that our Constitution guaranteed those named and unnamed rights from government interference and set up a system of governance unlike any other devised to that time. To those who say it is outdated, that the Second Amendment was written when muskets were the main large fire power so all arms are not protected, that it is a living breathing document to be interpreted as we go, nothing could be further from the truth. Note that he used the word permanent. And while constitutions “cannot calculate for the possible change of things,” they were learned men, who had studied history, and who had watched as the world constantly evolved, knowing that change would continue. They molded the Constitution and Bill of Rights the way they did because of that. So that it would and could endure. 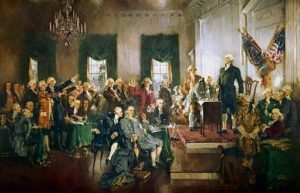 Is the U.S. Constitution perfect? Keep in mind, it is the only one of its kind in the world. And, we are the only truly free people in the world.